Our lives are filled with many moments—times of joy over the birth of a child, times of sorrow over the death of a loved one, and then there are moments when we are confused about what direction to take or even where to live and work. The joy of being a Christian is that whatever “moment” we find ourselves in, God is there with us. What a precious promise that He will never leave us or forsake us (Hebrews 13:5). That knowledge makes the happy times even more joyful, and the sad times bearable—for He is with us! As you begin your daily journey into Bible study in the coming year, thank God for the moments we have to live for Him and learn more about His amazing love for us. Take time to read the Scripture and pray that God will open your eyes of understanding as you read. Apply the truths found in each devotional and Scripture for that day to your life. Having the Word of God in your heart and mind will give you a renewed sense of His presence as you go throughout your day. You will discover even more opportunities to worship Him and to rejoice in what He provided for you—In Moments Like These. 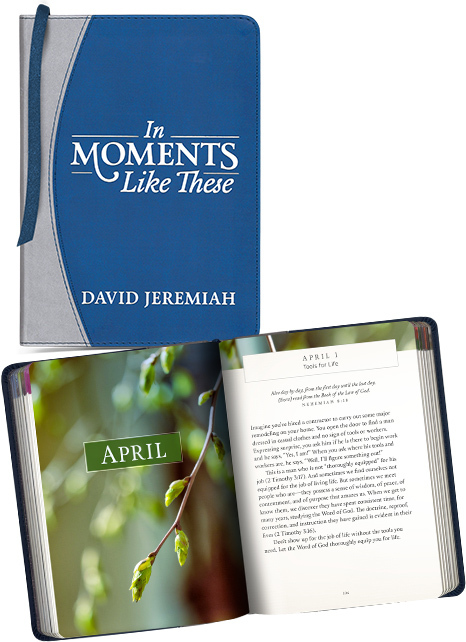 This colorful devotional contains biblical truth from Dr. Jeremiah for every day of the year, plus Scripture to encourage you in your walk and give you a renewed sense of God’s presence. Discover more opportunities to worship God and rejoice in every moment throughout the year! This Turning Point exclusive is available for a gift of any amount.